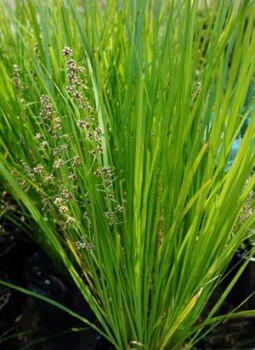 Lomandra is a hardy Australian Native clumping grass like plant related to the grass tree, and are readily available for sale in range of pot sizes. Strappy leaves and flower spikes that are fragrant in summer. A tough ground cover and can grow in full sun to shade. Lomandra longifolia is widely used in landscaping. The smaller growing Lomandra confertifolia is also used. L. longifolia ‘Tanika’ is a finer leafed more compact form with yellow flowers. Species such as Lomandra longifolia ‘Tanika’ have become a widely used as foliage plant in the landscaping industry. A great ground cover plant and a good alternative for exotic species. L. filiformis ‘Savanna Blue’ has a blue tinge to the foliage, stunning as a contrast. L. confertifolia ssp. pallida (see picture above right) is an excellent clump forming plant for a low border or hedge in full sun to part shade. Attractive light green foliage it can also be used as an accent plant in the border. Due to its low maintenance nature it is also widely used in roadside mass plantings. L. confertifolia spp. rubiginosa ‘Seascape’ has wonderful blue grey foliage, reaching around 70cm with weeping foliage, an excellent plant for the border or as a feature in a container. Lomandra grow well in full sun to part shade. They do require a well drained soil and are adaptable with some species growing well beneath trees. When planting, mulch around the base to help prevent weeds. Over time all species will form a clump that will out compete many weeds. Fertilize with a low phosphorous slow release type in spring. Depending on variety, these grass like, or strap leafed plants are useful for street plantings, as clumps in the general garden border as well as for container plants. Lower growing cultivars are useful as edging plants.